Well, that didn’t take too long. 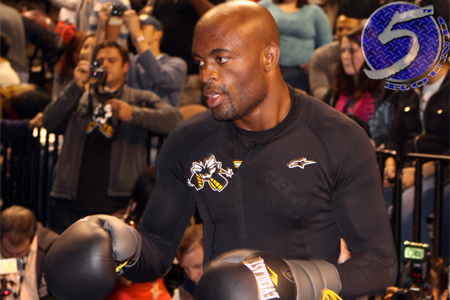 Exactly one week after former UFC middleweight king Anderson Silva (pictured) lost his crown to Chris Weidman, then proceeded to claim he wasn’t interested in a rematch with the man who abruptly snapped his seven-year reign, UFC president Dana White announced Saturday on ESPN’s SportsCenter that Silva has in fact agreed to a sequel. “UFC 168: Weidman vs. Silva II” takes place December 28 inside MGM Grand Garden Arena in Las Vegas, Nevada. Although Weidman entered UFC 162 as a 2-to-1 underdog, many MMA experts predicted he would dethrone the UFC’s most decorated champion. After Weidman scored an early takedown, Silva got to his feet and began to feel really comfortable inside the Octagon. In fact, he was far too comfortable. Silva started to clown Weidman by keeping his hands down and daring “The All-American” to punch him in the face. Seventy eight seconds into the second round and Silva found himself unconscious in the canvas. Silva had rattled off 17 straight victories prior to last weekend’s upset special. “The Spider” owned a UFC record 10 successful title defenses before running into Weidman’s left hand. Weidman stakes claim to an unblemished 10-0 professional record. Following the biggest win of his career, nobody wanted to arrange a rematch more than Weidman in order to prove his victory was not a fluke. The Gambling Gods have pegged Silva as an early -185 odds-on favorite to reclaim his throne. Weidman is currently a +155 underdog. Now that Part II will come to fruition, Silva will participate in the most anticipated rematch in MMA history for the second time in three fights. He steamrolled Chael Sonnen at UFC 148 to solidify his spot atop the 185-pound totem pole prior to meeting Weidman. UFC bantamweight queen Ronda Rousey and Miesha Tate were originally slated to headline UFC 168. The archenemies will now serve as the co-featured attraction.